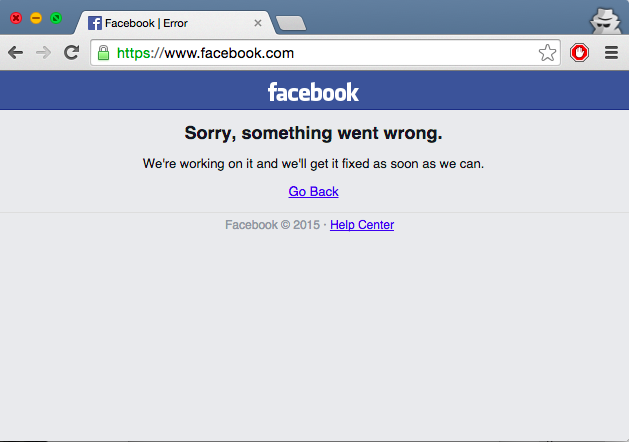 Yes, friends, the (not really) unimaginable has happened: the titan that is Facebook is down. We don’t usually raise our eyebrows too high when Facebook goes down for a minute, but it’s been in and out for a good 20 (update: 30!) minutes now. For a company that makes millions in revenue per day, every minute is tens of thousands of dollars in ad revenue lost. We’ve hit up Facebook to try and figure out what’s going on. Update: After 35-40 minutes of outage, some are reporting that it’s back online. Others are reporting it’s still down. Sounds like it’s coming back online on a server-by-server basis. Update #2: Looks like it’s back up for most people now.